Thankfully, Eddie Bauer has designed a unique travel system which not only makes baby feel comfortable and safe, it's everything mommy and daddy have been searching for too! I reviewed the Trail Hiker 3-Wheel Travel System in Red from Eddie Bauer which retails for $249.99, but is currently on sale for $199.00 at Target.com. I've long been a fan of Eddie Bauer, for this brand always creates durable, rugged products with great design and style. I've reviewed several Eddie Bauer items over the years and have loved each and every one. I was hoping the new Trail Hiker 3-Wheel Travel System would be no exception. This Eddie Bauer travel system is composed of three pieces: a stroller, rear-facing car seat and car base. It comes in three color combinations (red, blue and gray) and is available exclusively at Target. All three colors available are rather masculine, so I hope that Eddie Bauer is considering a more "feminine" color palette to the Trail Hiker lineup very soon. I'd love to see a purple, teal or pink color choice added to this collection. The car seat is rear facing only and designed for children up to 32" in height, weighing between 4 and 35 pounds. Comparably, the stroller is perfect for all children weighing up to 50 pounds. Both the Trail Hiker stroller and car seat are loaded with amazing features that prepare you and your little one for anything the open road may bring. Of course, my favorite feature of the Trail Hiker 3-Wheel Travel System is right there in the name...the stroller has only 3 wheels! This is like getting a durable family stroller and jogging stroller all in one. 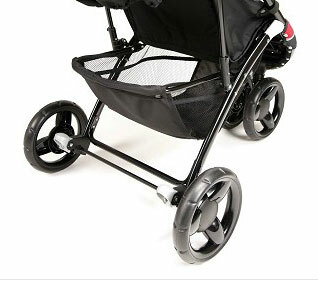 When I had Riley, I received a typical travel system which came with a typical stroller with four small, thin wheels. I tried running with this stroller a time or two and believe me, it doesn't work. The wheels just can't handle either the terrain or the speed and are only meant for walking on smooth surfaces. That's definitely not the case with the Eddie Bauer Trail Hiker Travel System. This little beauty can handle a hike both on and off the sidewalk. I tried it out on a short trail behind our house and it handled great! Having just one front wheel means that this stroller can maneuver much better than its 4-wheeled counterparts and the larger tires can handle more speed too. I can't speak to how smooth the ride in the Trail Hiker Stroller is, since I no longer have a small child to try it out with, but it definitely appeared to be smooth and was a breeze for me to push. This Eddie Bauer Travel System also makes life on the go much easier, providing plenty of storage space in several places. The large basket under the stroller itself was quite roomy and the perfect size for mom's purse, a baby bag and quilt. The parent tray contained deep cup holders and a covered compartment, just perfect for storing your keys and cell phone. Finally, I was impressed that even the child's tray had a deep cup holder and spacious tray. Now snacks, toys and a variety of bottles and sippy cups can be stored with ease. I also love the design of the stroller's handle because it's completely adjustable, so no matter whether you're super tall or super short, you can travel in comfort. Also, both mom and dad can have a custom fit because gone are the days of the "one size fits all" handle. Both the stroller and the car seat have a 5-point harness for the ultimate in safety, and with a quick pull or release of the zip cord behind the stroller's seat, your child can be elevated or reclined into a variety of positions. As for the car seat, it's important to note that this model features a rear-facing car seat only, accommodating children up to 35 pounds. Personally, we turned Riley forward once she reached both the age and weight requirements. If you are planning on doing this too, you might not get quite as much use out of the car seat. That's why the Eddie Bauer Trail Hiker 3-Wheel Travel System is truly the perfect baby shower gift for brand new parents. This system is definitely designed to be used as soon as baby is brought home from the hospital. 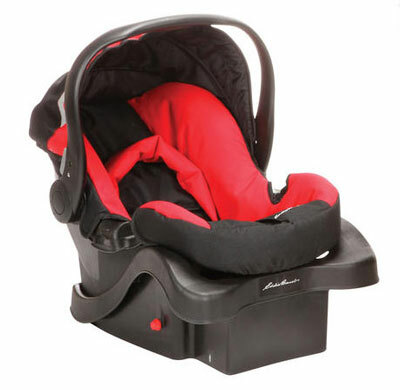 The car seat features side impact protection as well as a removable infant head support. I love that this head support comes as part of the travel system itself, for I had to go out and purchase one separately when Riley was born. Those precious little necks just can't support those noggins during the early stages of life and an infant head support is mandatory. This car seat also features an adjustable car seat base so that the car seat itself can "QuickClick" in and out to double as an infant carrier. Who wants to dare wake a sleeping baby? :sleep: Now with the QuickClick feature, both parents and baby can rest! Finally, because this car seat is LATCH equipped with an included level, it's super simple to safely and accurately install this system in any car. My husband has installed numerous car seats in several cars over the years and admits that the LATCH installation method is the only way to go. Disclosure: I received the Trail Hiker 3-Wheel Travel System in Red from Eddie Bauer in order to facilitate my review. No other compensation was received. This product review is based on my own personal experiences with this item and is completely honest and objective. Looks like anawesome stroller would love one. The Classic High Chair — perfect! Sport Convertible Car Seat – Harmony Love it. I’m going to have a Grandson in April. The Colfax Style of the Complete Care Play Yard item looks great! I also like the Comfort 65 Convertible Car Seat – Colfax. i loooove the high chairs, the “classic”…any design! I would also love to have the Complete Care Play Yard – Clearbrook. and i been looking everywhere for play yards. didnt know eddie bauer made them. I like the Complete Care Play Yard – Evergreen. I think it would be the Classic High Chair in Evergreen, they look so well made and the fabric is so pretty! Thanks for the amazing giveaway! Their Classic High Chair! I have looked at it before but I see it is on sale! Awesome price, in case anyone else is interested — http://eddiebauer.djgusa.com/en/djgusa/eddie-bauer/high-chairs-10188–1/classic-high-chair-hc091awr–1 Only 83.99! I would like the Classic High Chair-Charter. I dig the Complete Care Play Yard – Clearbrook… Thanks!!! I would love the Complete Care Playard! Super nice for travels!! The all terrain tandem stroller would be awesome! The Classic High Chair – Charter would be perfect for my new granddaughter. The Complete Care Play Yard – Michelle would also be perfect!! Complete Care Play Yard – Colfax …this looks wonderful! The complete care play yards would be very nice. I love the Complete Care Play Yard! 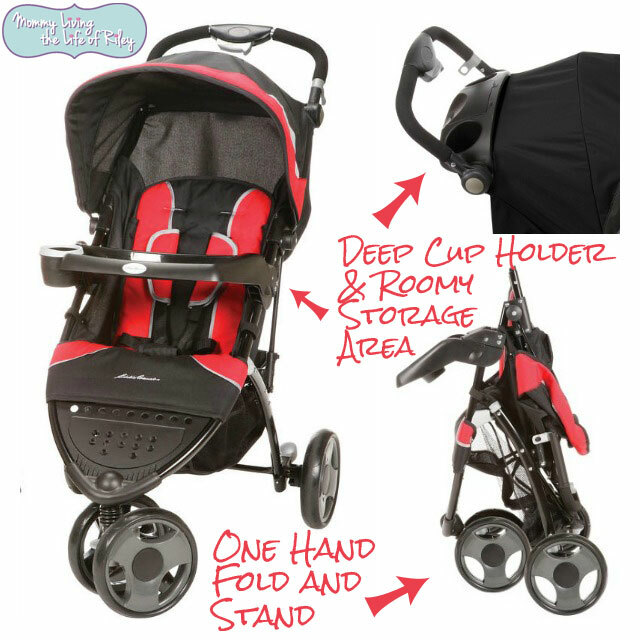 I like the Eddie Bauer All Terrain Tandem Stroller! Complete Care Play Yard – Colfax would be perfect. I like the Complete Care Play Yard – Fairview also! I like their glacier blue tandem stroller. The Sport Convertible Car Seat would be perfect for my growing boy. he has outgrown his old one. Destination Infant Car Seat – Colfax would be great! Eddie Bauer is a name from my own childhood. I would choose anything they make over any other brand. My own parents are the best reference any brand could ask for. the classic highchair would be my choice. I like the Sport Convertible Car Seat! We could sure use the ClearbrookPlay yard! Nice canopy and fold away changing station. Much better than most designs. We have one grand daughter live with us and another grandson comes for day care here…it would be so great to have him have his own safe place to sleep. I do love the plaid colors of the eddie bauer sets. The stroller would be awesome for our grandson. Mom and Dad do not have one yet and he is over a year old. Just what mommy needs to shave off some of the baby weight and stress weight she gained when he was in NICU for months. The backseat animal mirrors! So cute! I absolutely love the entire Clearbrook collection! Eddie Bauer’s Compete Care Play Yards are wonderful. Evergreen is my favorite! I would love to have the Comfort 65 Convertible Car Seat! I love the Complete Care Play Yard Set. Thank you for the giveaway. I have two daughters hoping to get pregnant this year so this would be amazing to win. I think the Deluxe RollerShade™ 2-Pack would be a nice addition to the car. I like the XRS 65 Convertible Car Seat. Very stylish and can convert so many ways. I like the Complete Care Play Yard in Evergreen. The evergreen collection would be perfect for our new addition. I would like to have the Eddie Bauer All Terrain Tandem Stroller – Blue Glacier too! I love the charter high chair! With a newly 2 year old and another on the way this summer I would really love the http://eddiebauer.djgusa.com/en/djgusa/eddie-bauer/tandem-strollers-10183–1/all-terrain-tandem-stroller for those long outings. I also love the Complete Care Play Yard in Evergreen. The complete care play yard would be perfect for my son because we have no portable play area for him right now. Pregnant with my first miracle and just came across this great travel system! Crossing my fingers. I would love to own the Classic High Chair in Evergreen. The Complete Care Play Yard Set looks very nice!